If you don’t think discussing theology and doctrine with your kids around the dinner table sounds like much fun, you’re not alone. Unfortunately, many young Christian kids are not amassing accurate Christian doctrine and its having a serious impact on their faith. Teaching theology and doctrine was one of my focuses this summer with our kids. Here’s how I figure it: If our kids grow up to reject Christianity, I at least want them to have an accurate understanding of what it is and what it isn’t. I want them to understand what answers it does have – and how solid they are – to explain evil and suffering, the meaning of life, where we came from and what happens after we die, how we should live, etc. I don’t want them to fall for strawman arguments against Christianity, and I want them to know the weaknesses of alternate worldviews. I have to say, I was surprised at how many questions came out of these discussions about doctrine! If you want to get your kids asking questions about their faith, consider these twelve questions to get the ball rolling. 1. How are we like God and how are we different from God? 3. Who wrote the Bible? Why is it important to learn what the Bible says? 7. Why does God want us to worship Him? How do we worship God? 8. If God knows what I’m thinking and what my needs are, why do I have to pray about them? 9. Why doesn’t God always answer my prayers? 11. Does God really expect us to forgive everyone who hurts us? Why? 12. Why should we tell people about Jesus? What if they don’t listen or believe me? Obviously you’ll need more that just these questions to build a solid theological and doctrinal foundation into your kids. If you are having a hard time answering any of these questions yourself, perhaps you need to brush up on your own understanding of theology and doctrine. Try A Survey of Bible Doctrine (Ryrie) or Doctrine Matters: Ten Theological Trademarks from a Lifetime of Preaching (Piper). Both are easy to read and understand, and will greatly improve your ability to help your kids have an accurate and solid understanding of the Christian faith. 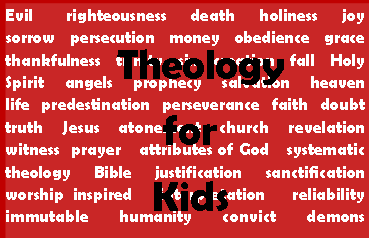 UPDATE: Here is another kid-friendly resource to help you to teach Christian theology to your kids at their level of understanding. It’s called Big Truths for Young Hearts: Teaching and Learning the Greatness of God by Bruce Ware. It’s not a read aloud book, in my opinion, but will give you concepts and terminology to explain big theological questions to young children. FYI, for those who like definitions: Theology is the study of God; doctrine is a set of beliefs that are considered authoritative and stem from right theology. How have you helped your children to understand Biblical doctrine? Would be a beautiful series for you to write about these 12 questions and how you would answer them / teach them to your children. Thanks for the book recommendations at the end of the post. Thanks for the suggestion Andrew. I will think about doing that.